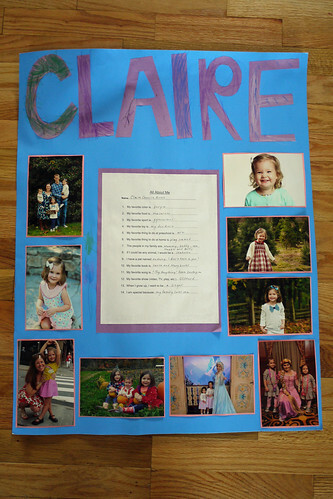 Claire turned five on March 13th! 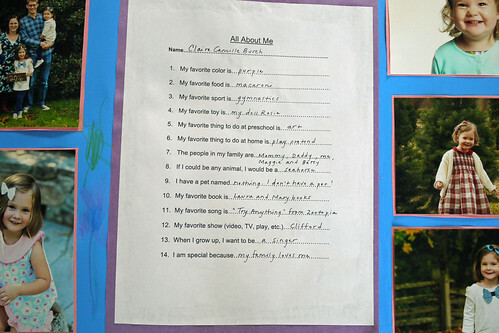 On her actual birthday, she got to bring in her "all about me" poster to preschool and explain it to the class during circle time. She really wanted to bring in those soft sugar cookies with frosting and sprinkles from the grocery store as her treat to share with her classmates. Easy enough! 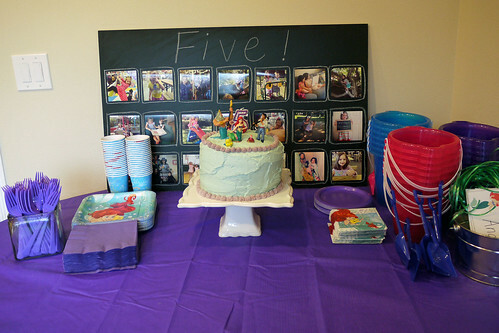 On Friday afternoon, we threw a Little Mermaid themed party at home for eighteen little friends. 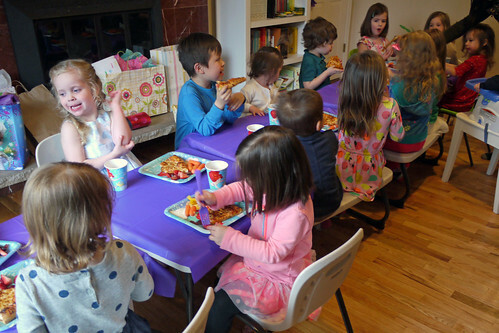 We invited the other five girls from her preschool class and four friends from church, but when they all have at least one younger sibling, it turns into a very big party rather quickly! 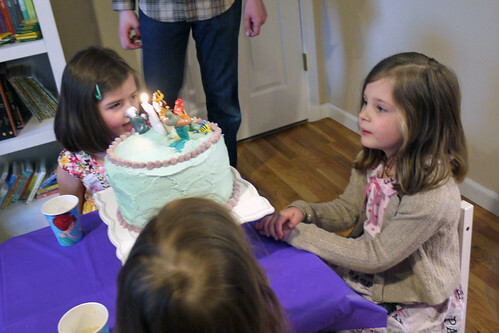 Claire and Maggie helped make the four layer vanilla cake with frosting in Claire's favorite colors. 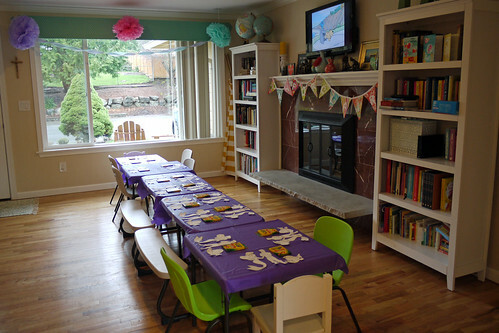 We borrowed a few kids' tables from friends and moved most of the living room furniture (arm chairs, toy cubbies, coffee table, sewing desk) into our room. We also cleared out almost all the toys out of the playroom, just to make clean up easier. 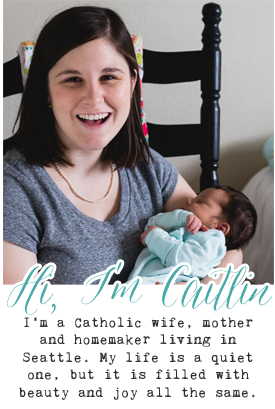 Claire is really into making what she calls "paper dolls" lately and requested that as the party craft. 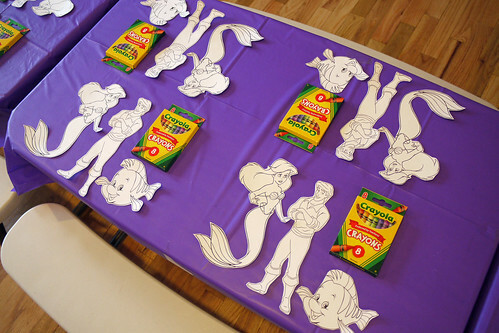 We just printed a bunch of Little Mermaid characters out on card stock, cut them out, and gave everyone a pack of crayons to take home as part of their favor. 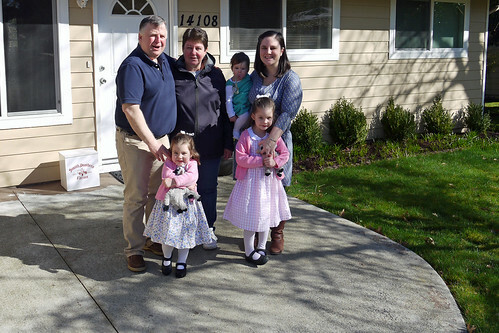 The other part of the favor was a pail and shovel from the dollar store. 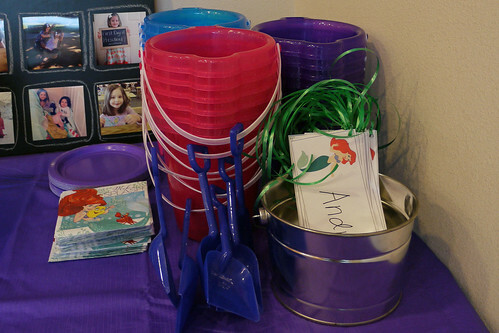 We figured it kind of went with the mermaid/ocean/beach theme, would hopefully actually be useful in the summer, and the kids could use them to store their candy from the pinata. 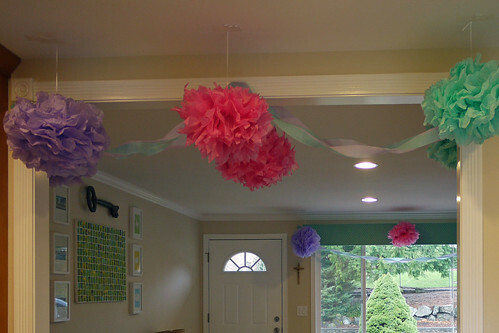 Although Claire wanted the decorations to be like "the Little Mermaid ride from Disney World," we just stuck with streamers, tissue paper pompoms, and purple tablecloths. 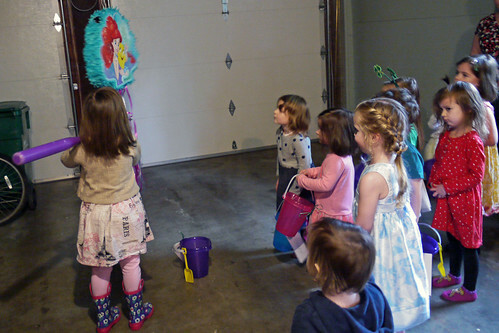 Around 4:40, we went out into the garage to do the pinata. (It was pouring rain, unfortunately, so it had to be indoors.) Everyone got a chance to whack at it with no luck, so then they each got a chance to pull a string. 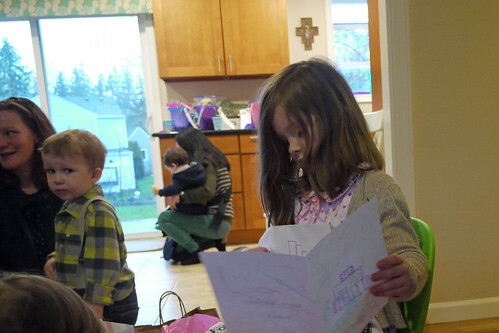 The one older sibling in attendance eventually figured out which was the magic string and revealed the candy inside. Claire picked her two favorite kinds - M&Ms and gummy bears. We came back inside for a dinner of Claire's choosing - pizza, bell peppers, baby carrots, strawberries, grapes, and lemonade. 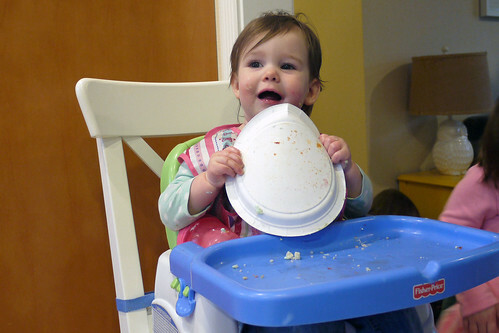 Betsy enjoyed it so much that she was licking her plate. It was about 5:40 when everyone had finished their cake. 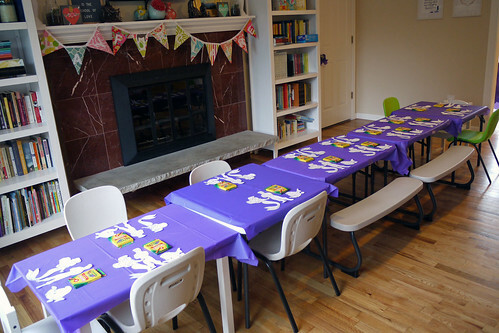 We weren't quite sure how long things would take, so we didn't have anything formally planned until the party ended at 6:00. We ended up herding the kids back into the garage to play "freeze dance" with a couple Little Mermaid songs and then coming back inside to open presents. 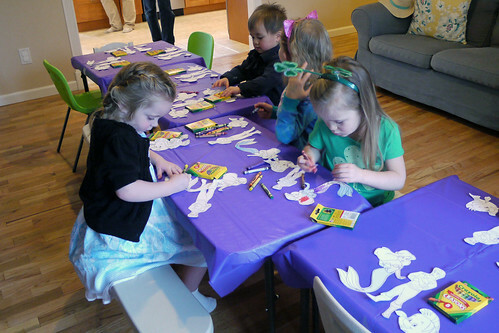 In the future, I would have a different, calmer party game planned - something like "Pin the Fin on Flounder." I'd also come up with a better strategy for opening presents so that it's less chaotic. Ideally, while the kids were busy with that game, I would have had Adam move all the tables out of the way so that there would have been space to sit in a circle in the living room, that way all the kids could easily see Claire unwrapping her gifts. 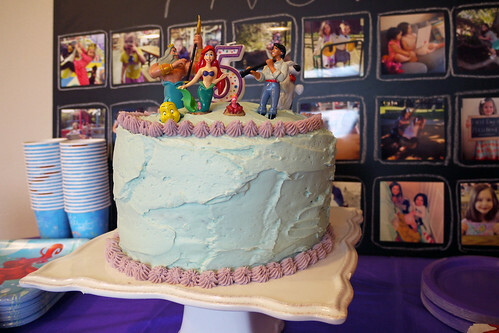 That's actually a smidge more expensive than her fourth birthday party, which we had a little jumping place for preschoolers. 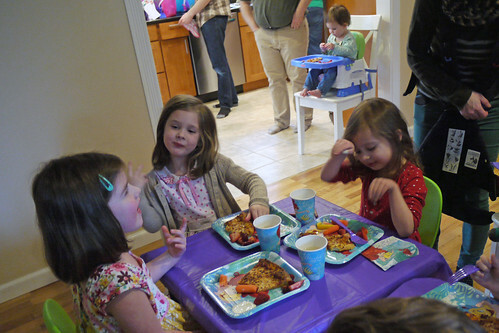 Maggie had her party there too, but it was even cheaper because we won the party package in the parish school's auction. 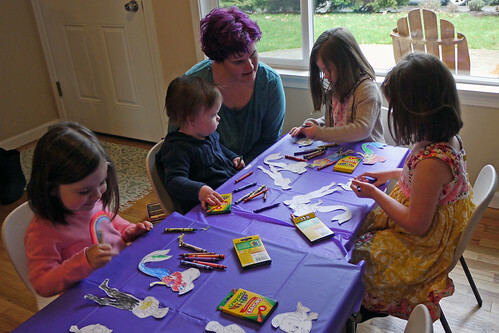 In the future, I think we need to keep parties at home smaller, either inviting less families overall or inviting just the child that is the birthday girl's age, once our kids are old enough for that. Both to save money and to keep things like chaotic! And I will definitely be looking for auction deals again - I know they had a few other party packages last year. 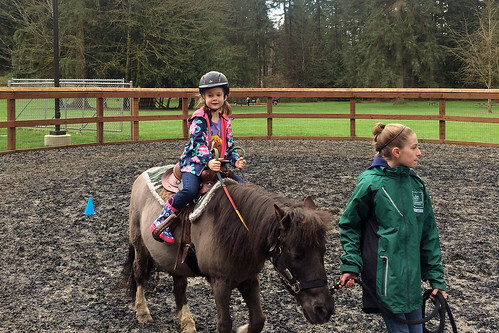 On Saturday, Claire and Maggie had horseback riding lessons at our town's farm park. We try to sign them up twice a year - once in the fall and once in the spring. 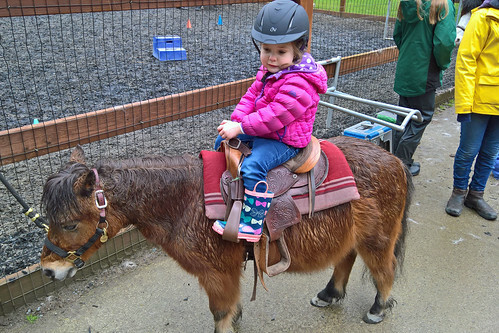 Now that she's five, Claire moved up to the next level and got to learn how to trot! Adam took Claire in the morning and Maggie in the afternoon, while I stayed home to play board games with the other sister. My parents visited for the weekend. 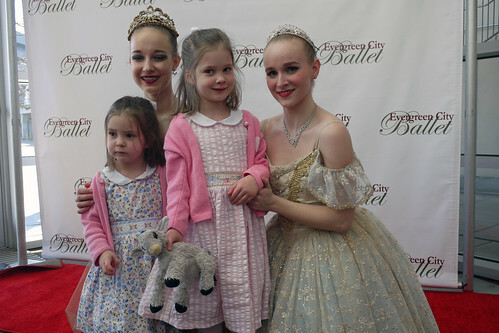 As always, it was so great to have them here for Claire's big day. Because it's so tricky to drive through the mountains in the winter, we hadn't seen them since Christmas! 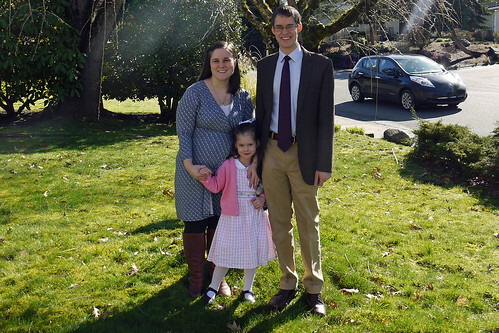 When putting Claire's little birthday slideshow together, we realized that we didn't have any pictures of just the three of us together, so we forced Claire into posing with us. 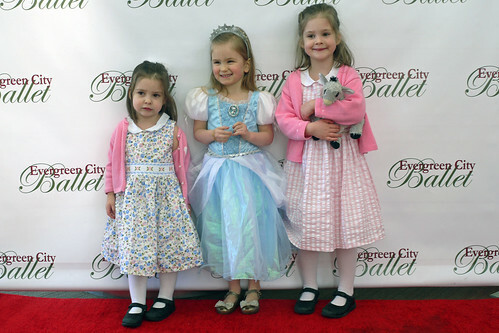 After the ballet, we picked up some fancy cupcakes to celebrate Betsy's baptism day. A great way to end the weekend! 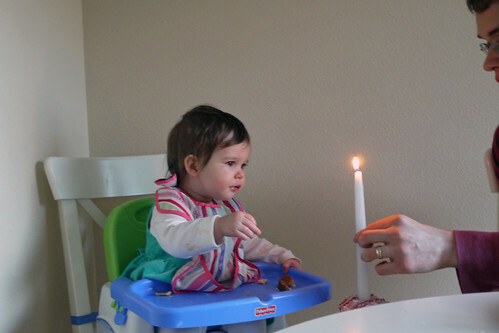 Until October, now we officially have a one year old, a three year old, and a five year old.